Ercole Spada started working as a designer for Carozzeria Zagato, and found himself plunged into the world of racing. 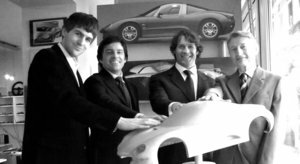 Coachbuilders focused almost all their production on racing and Elio Zagato himself competed successfully in the Gran Turismo category. This is the reason everything designed since then has been permeated by a philosophy of constant improvement and perfection based on the results of a series of experiences. The 1300 Gran Turismo category raced in 1959 and 1960 were entirely dominated by the Sprint Veloce version of the Alfa Romeo Giulietta. In order to keep up this successful run, Alfa Romeo decided to commission two more specialised variants for the races. The one for fast circuits, which became the Sprint Speciale, was entrusted to Bertone while the other went to Zagato. This was the SZ, for hillclimb races. 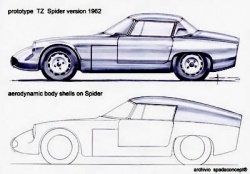 Instead of the chassis for the Sprint (2380 wheelbase), it was decided to use the shorter one for the roadster (2250 wheelbase) as it was lighter and easier to handle. The result was that, even though it looked compact and apparently less aerodynamic, the Giulietta SZ remained unbeatable even in speed racing. This superiority, which was maintained in road racing, was attacked on fast tracks by the Lotus Elite. It is worth bearing in mind that the Alfa Romeo was based on a standard production chassis, while the Lotus had been created as a sports car with a special chassis, ideal distribution of weights, and specially designed suspension. From the mechanical point of view, the Giulietta had by this time reached the peak of its development, so in order to increase its speed we needed to concentrate on the bodywork. I decided that we needed to lengthen the body and, as an initial test, I took the profiles designed by Frank Costin in 1957 for a Maserati 5000 Sport which was driven by Stirling Moss at Le Mans. Adapting the lines to the size of the Giulietta, I had a cage made of rods built directly onto the car and a worker modelled this new shape in aluminium sheets. This operation lengthened both the rear end and the front. These new appendages were screwed directly onto the existing bodywork and, when it was ready, we carried out a series of tests. With Elio at the wheel and me next to him with a stopwatch we carried out a series of kilometre runs on the Milan-Bergamo motorway, with me taking the time of each one. After returning to the starting point, we took off all the fairings and then did the same kilometres again, recording the times in order to see the difference. It was an empirical approach, but it worked. However, not satisfied with this initial test, tried out other shapes until realizing that a needed to stretch the rear considerably in order to get a significant increase in speed. The definitive version of the SZ was ready to make its debut on the racetrack in June 1961. On 29 June, the SZ coda tronca [literally, “truncated tail”] was driven to pole position by Elio Zagato himself and went on to win the race with ease. This new variant of the Giulietta enabled Alfa Romeo to maintain its supremacy in the category while a new GT was being developed: this was to be the Giulia TZ. Spada started creating the first designs for the Giulia TZ, but were still influenced by traditional shapes. The prototype, which Alfa Romeo wanted as a roadster, and in terms of aerodynamics, a very high, headrest-like rear end was made in order to reduce turbulence behind those on board: this section, which extended to the cleanly cut-off tail, created a design that was emphasised by a peripheral frame. This was repeated on the production version of the Giulia saloon. The first road tests showed that the aerodynamics were not perfect, so we decided to add fairings to transform it into a fastback coupé. After making this decision, the shape was reworked, except for a few details, this was the definitive design for what became known as the Alfa Romeo Giulia TZ and the Alfa Romeo TZ2. Designed and produced by the Italian design house SpadaConcept in conjunction with the tuning firm UK Garage, the newest supercar -- the Spada Codatronca, might just be the car you had in mind. You may have heard about SpadaConcept – it is the same design studio responsible for designing such classics as the Aston Martin DB4, Fulvia Sport Zagato – to name a few. Ercole Spada and his son, Paolo Spada, who also happens to be the company’s new design director, reportedly drew influences from their original 1965 Alfa Romeo TZ that also featured a fin-like rear called the "Kamm tail coda tronca" design. Now Spada have released full technical details of their exciting new limited-production supercar, the Codatronca, which, according to the company’s website, can be expected to be available in three hand-crafted versions, two of which will be fully road homologated super cars, the TS (Turismo Sportivo) and the TSV (Turismo Sportivo Veloce); with a third race destined option, the TSS (Turismo Super Sportivo), which was described by the Italian firm as "the finest race version which will be delivered soon." Based on the Chevy Corvette, the Codatronca features heavy Mako Shark infuence in the front end design. It is a front-mid-engined, rear wheel drive two-door coupé featuring a very lightweight aluminum spaceframe structure combined with a magnesium roof section and similar composite treatment for the engine cradle. You should know here that the engine is a tweaked Corvetta C6's aluminium block V8, and cylinder head comes with an eight-quart dry-sump lubrication system, titanium valves and connecting rods. Spada also fits twin Rotrex superchargers, dual intercoolers, sequential fuel injection and a boosted compression ratio of 11:1. All this combined delivers an impressive 600 hp at 6,300 rpm and 790 Nm of torque at 4,600. The power is channeled through the rear wheels via a short-throw 6-speed manual and all is Euro 4 compliant. The "base" Codatronca TS, according to Spada reaches top speed of 330 km/h and 0-100 km/h (62mph) time of 3.2 seconds. The lighter-weight (1380kg) and more powerful (700hp) TSV track version, says the company, is set to deliver a top speed of 355 km/h and an astounding 2.7 second 0-100 km/h time. Spada Vetture Sport is glad to announce the manufacturing of the brand new Codatronca TS . Disclosed on April 24th during the Top Marques Monaco ( The Luxury and Supercar Show) as a world premiérè, collecting a big success from the international press and also from the crowd of people present at the event. Discovered during the Top Marques opening by the ex-car driver and F1® Champion Damon Hill it was elected most beautiful car of the exhibition also by the prestigious New York Time daily Magazine. 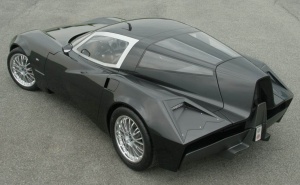 Codatronca it’s born by the pencil of Ercole and Paolo Spada, the guide lines that has characterized the project of these new car are: aerodynamics, lightness, and pleasure of driving. The same guide lines that portrayed most of the project of Ercole Spada, like the mythical tz1 and tz2, were characterize by the back shape called “codatronca”. The Codatronca TS is proposed with different engine that can works, in the states were it’s present, with BioFuel E85. The engine has mecchanic and electronic components developed respecting the specification of the project needs, in this way we’ve obtained from the V8, in aluminium of more than 7lt with a dry sump, with a power of 630hp at 6500 rpm, with an incredible torque of 668Nm at 4800 rpm. The power is transmitted to the ground by the rear wheels thanks to a 6 gear close ratio transmission with a specific range also at the 6th gear to the limit of 7000 rpm that push the codatronca at 340Km/h with an acceleration from 0 to 100Km/h of only 3,4 sec. The designers gave more importance to the pleasure of driving instead of speed record, in the perfect style of the gentleman driver. For support that performance, the codatronca is fitted with a traction control on 3 level of action that progressively excludes only the traction control and after another push leaving the car to the bare control of its lucky owner. For a better check of the car’s data, Codatronca has an equipment that can record since 80 hours of telemetry on track, with 40 active channel (steering angle, g meter longitudinal and lateral, sinlge speed for each tyre, lap timer and gps tracking system for track trajectories and lots more). The chassis is a light and stiff aluminium tubular with a roll bar cage combined for offer the maximum protection also when it’s driven on track. The bodywork is made of light and resistant fibre that cover the chassis and the mechanics parts. The suspension are completely adjustable like the one of the racing cars. A big news is represented by the possibility of set up the anti-roll bar on the front and on the rear separately on 4 level of hardness: rain, soft, medium and hard with an on-board regulation. In that way the wheel can work at its best and the suspension in every condition, especially when the car is on track due to the selection of harden or soften the axles for a perfect grip. The wheels are the Pirelli Pzero Corsa, with size 285/35/19’’ for the front wheels and 345/35/19’’ for the back wheels. The rims are of 19’’ by Oz, these were chosen to assure that the shoulder tyres transmit best the drive feelings of this fantastic tires. The braking system is Brembo with racing 8 pistons aluminium calipers on the front with discs of 380mm and with 4 pistons aluminium calipers with discs of 355mm on the rear; governed by an Abs system of the latest generation. The aerodynamics shape of the car is represented by a low value of cx, measures are a length of 4659mm, a width of 1942mm and a height of 1235mm. The weight is very low, just 1360Kg for a unique pleasure of drive. The Codatronca® shape of the back gave the possibility to the designer, to create a perfect 400 litre trunk, flawless for two people, and customizable with a suitcase set purposely made by Aznom srl. The cockpit is bright and roomy and it’s provided of a technological air-conditioner system and a perfect acoustic, the back view is assured by a rear view camera. Inside we can find the watch designed by Meccanicheveloci with automatic recharge, a taste of the italian’s craftmenship. The car is available at SpadaVettureSport in a limited number every year.